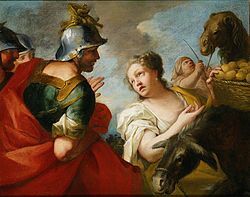 David y Abigail por Antonio Molinari. ↑ Adele Berlin (2000). Eerdmans Publishing, ed. Women in Scripture: A Dictionary of Named and Unnamed Women in Hebrew Bible, the Apocriphal/Deuterocanonical Books, and the New Testament. ↑ John D. Levenson and B. Halpern (1980). The Political Import of David's Marriages. Journal of Biblical Literature. ↑ Adele Berlin (1994). Poética e interpretación de la narrativa bíblica. Wikimedia Commons alberga una categoría multimedia sobre Abigaíl. Esta página se editó por última vez el 29 jul 2018 a las 08:54.